People should leave this couples alone, they ought to be on their honeymoon by now, I wonder why they shouldn't have peace, the marriage is not even up to a week old yet and scandals everywhere, we all know Jude Okoye was Not In Ghana, He Was In Lagos Throughout The Wedding, Lola, gave birth to her first baby, there was no noise about any DNA, she gave birth to the 2nd one, there was no noise about any DNA, now he has decided to marry the mother of his lovely kids, and the only things some persons could do is to bring out false rumors. 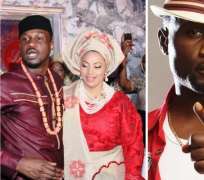 According to NET: On Sunday, November 17, 2013, Lagos stood still for Psquare's Peter Okoye and fiancée Lola Omotayo as the couple held their traditional wedding ceremony, surprisingly elder brother Jude Okoye was missing. Social network has been buzzing. The twins' publicist Bayo Adetu tells NET Jude was missing at the wedding because he was stuck in Ghana. Psquare had performed in Accra, Ghana at the 'Glo and Bounce Slide' tour the night before. Adetu says Jude missed his flight and couldn't get back to Lagos in time for the nuptials. But a source who was part of another artiste's entourage to Ghana for the concert says Jude Okoye did NOT travel to Ghana. 'We didn't see him, the twins were here with their band but we didn't see Jude', our source who'd rather stay anonymous tells NET. There are few instances pointing to the fact that Jude did not travel with his Pop star twin brothers to Ghana for the concert: Jude, a regular user of photo sharing Instagram never fails to post photos of their trip outside Nigeria – there were no photos of him aboard the airplane heading to GH, photos of the twins performing at the concert. One source asks: 'If he was truly stuck in Ghana, wouldn't he have even lamented on Twitter like D'banj?'. Instead Jude posted a photo of himself and Wizkid in the studio. The picture is believed to have been taken a night before at the Mavin Records studio where he had been working with Don Jazzy, Dr SID, Phyno and others. Inside sources in the Okoye family tell NET that Jude Okoye and a few other family members did not support their brother's marriage to his baby mama Lola Omotayo. Some sources also also claim their late mother never supported the relationship too. 'Jude and some others don't like her. They never gave their blessing for the marriage. Paul too, but he is his twin. Other family members who were there were reluctant to attend. Jude didn't go because he never supported the idea from day one', a family source tells us. Some of the Okoye family members have even gone as far as insinuating that Lola Omotayo has allegedly constantly cheated on Peter Okoye. NET gathered there have been demands for a DNA test to really ascertain whether his children Cameron and Aliona are truly his. 'It's that serious, they claim Lola sleeps around with her so called 'uncles', they want a DNA test done, they just want to protect their brother'. Lola currently lives in a mansion in Park View estate, Ikoyi. The Okoyes are currently building their new home somewhere not to far from there. It is uncertain where the couple will make their home. Jude Okoye has been working with Psquare, his younger brothers since they released their first album 'Last Nite' under Timbuk2 Music label back in 2003. Why didn't it happen before the marriage took place, from what I saw at the wedding, everyone was happy and even his twin brother was totally happy all through. Why can't people just allow the newly married couple to rest. Whether they love Lola or not, all that matters is that Peter Okoye has made his decision. One thing that is confusing here is why would they accuse lola of infidelity, she is from a wealthy family so what would make a man lure her to behave weird, she is fertile and happy with her love so let people let this lady enjoy marriage life as a human being and not because she is married to a celebrity. The wedding has been done, no matter what publicity stunt released now doesn't change a thing.